Confined in the middle of Abbotsford, this small shallow lake can be surprisingly productive for anglers who do not mind the urban setting. Designated as part of the "Fishing in the City" program by the Freshwater Fisheries Society of BC, Mill Lake is regularly stocked with rainbow trout in spring and fall. In hotter months, largemouth bass and other spiny-ray species can be abundant. The shoreline access is easy, making it an ideal venue for families. It is also a great fishery for anglers who wish to use a float tube or small boat. Because it is located in an urbanized area, there are many access points to Mill Lake. From Vancouver, travel east on Highway One and take the McCallum Road exit. Travel north on McCallum Road and turn left onto South Fraser Way. Continue and turn left onto Bourquin Crescent, then turn right onto Mill Lake Road, which takes you to the main parking lot where the boat launch is located. Other parking lots can also be found along Bevan Avenue on the south side of the lake. There is a paved walking trail around the lake. The trail is is around 2.5km long. There is also a foot bridge along the eastern shoreline. Fishing can be done at almost any point along the lake shoreline. The easiest sections are the south shoreline, the dock by the boat launch on the north shore and the foot bridge on the east side. Fishing can be done year round at Mill Lake, but the best period is between March and November. The lake is stocked with rainbow trout by the Fraser Valley Trout Hatchery between March and June. Stockings are not done in July and August due to the warmer weather, but fishing for bass and other spiny ray species can be good during this period. Rainbow trout stockings resume in late September until November. Although it is usually cold between December and February, trout fishing can still be good at times. 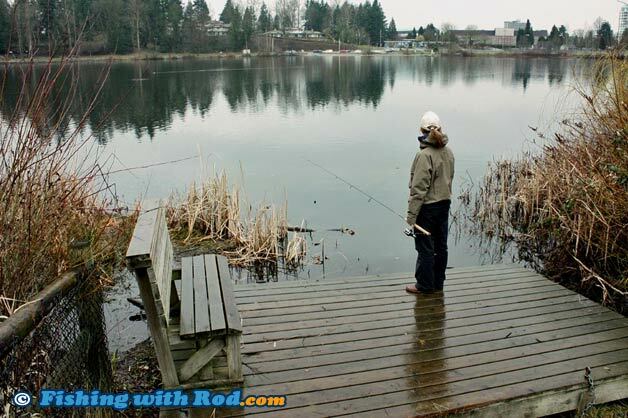 When fishing from shore at Mill Lake, bottom fishing is a popular technique that allows you to cast your bait out as far as possible. You can sit and wait for the fish to find your bait, which can be deli shrimp, dew worm, single eggs or commercially made bait. If the waiting game becomes too dull, then tie an artificial lure on. Casting and retrieving a lure such as a spoon or spinner can instantly grab the fish's attention and trigger a bite. Fishing from a boat or float tube is the most effective method, because it allows you to cover as much water as possible. You can simply troll a lure slowly, or anchor and bait fish. You must have a valid British Columbia freshwater fishing license. Mill Lake is located in Region 2 in the British Columbia freshwater fishing regulations. You can check Region 2's trout stocking database to see when stocking takes place. Mill Lake is located in the City of Abbotsford. Please respect local residents and other users when using the area. Keeping the noise level down and picking up your own garbage makes everyone's experience enjoyable.